Hello my FINE Friday friends! Are you happy to see this day? I sure am and if I haven’t said it for a while, my heart and my love go out to you for reading this little space on the great big Internet! 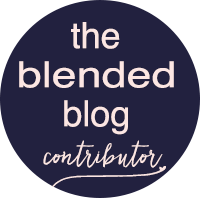 You are the reason I keep on blogging because you make it all worth while! 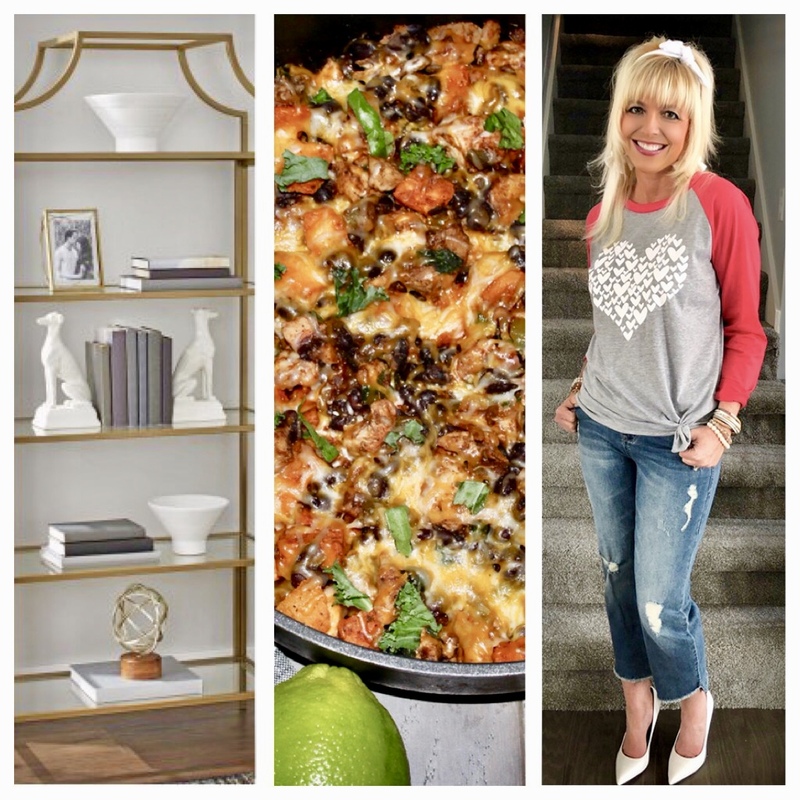 Going to share some love with you today for Friday Favorites! Lots of Sweet Love to share today! 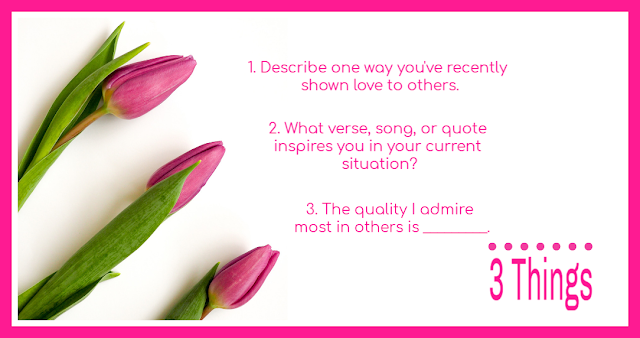 How special is it to receive tokens of love from the people you care about most! I received several of those this week, adorable early Valentine's! My girl! You know her you love her, the unbelievably precious Laura from The Horton Family. This girl knows what’s in my heart and she knows how to be a true friend spreading love wherever she goes! Just look at this goodness. It’s so funny because I had linked up the truck T-shirt below before I received her package yesterday and lo and behold: one of my favorite things, a red truck holding so much love! My sweet Mr. Nine knows my love of pens and paper runs deep! A Couple years ago he got me my favorite pen to which of course, I lost! He surprised me this week with not one but four of my beloved Parker pens in the prettiest colors! A "Just Because"Gift! On Wednesday, I shared the cutest heart baseball tee and it prompted me to share some more cute T-shirts with you because I mean come on, most of us are casual in our Valentine style and busy lives, mom lives, and weekend fun just want us to be comfortable in soft and cute festive tees! Oh yes, this is one of my favorite combinations: red, chambray and lovely lovely leopard! These pants from the Loft are a favorite of mine! And can I say, I am so loving my Amazon phone remote hooked up to my regular camera tripod. In Case you missed em'! 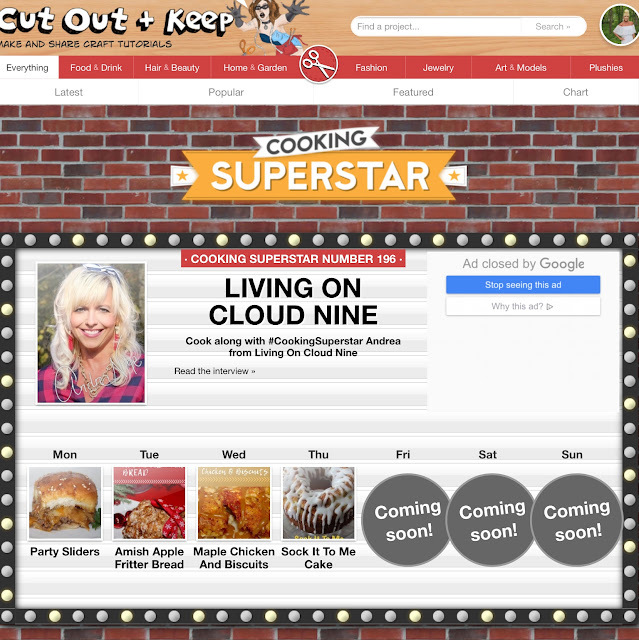 I know I mentioned this on Monday, but I had to give a shout out again to the wonderful folks at Cut Out and Keep for my Cooking Superstar feature that they’ve been sharing this whole week! It goes until Sunday and my heart is grateful! I find so many good things on their Site. Just because we LOVE you so much!! Go to this Instagram Page on how to win this AMAZING goodness! I am what is called a Ghost Participant on this giveaway so it won't be in my post but will be on my stories. MY goodness, I wanna go wild in Sephora!! YOU are all the Gift I need!! I love all your Valentines!! So sweet! Love the graphic tees too. So cute!! Again that tee is perfect on you- thanks for spreading the Valentine love- have a wonderful weekend Andrea! What sweet gifts you've received! Laura is just the most thoughtful and precious! Every time I see red truck decor I think of you! I hope you have the happiest, love filled weekend sweet friend! So much love in this post!! That double hearted bicycle is the CUTEST!! You know I love red so those Loft pants are fabulous. Have the best weekend Andrea! I love that red, chambray, and leopard look!! So cute! And look at your precious mom sending you Valentine goodies!! Have a wonderful weekend! Aweee so sweet to get all those goodies! You totally deserve every thing you get, missy! My daughter got those pens for Christmas! Wishing you a wonderful weekend. What a sweet mom and gift! That bicycle is adorable. Have a wonderful weekend! Yay!! I am so glad that you got your gift and enjoyed it so much! Like I said, as soon as I saw the red truck, I thought of you and knew you needed it! Can't wait to see how you display it for the day of LOVE! Your denim shirt and red pants made me smile this morning because that's one of my favorite outfits to wear (and I haven't done it in a while, so maybe I need to really soon!) and I usually wear a leopard cardigan over my chambray shirt. Oh, so cute! And so are you my friend! So glad I got to share a little bit of love with you this week (I just wish I could have held the secret in and then it REALLY would have been a surprise!). Have fun this weekend in whatever you and Mr. Nine decide to get into! P.S. And I really love that bicycle, too! Your mom is so awesome! I hope she enjoys Florida! I love all of your sweet gifts you received. Love your outfits and hope you have a happy Friday. What cute little presents. You have an awesome tribe!! What a sweet friend you have! Those gifts are precious. Your husband did a great job too! Your post is as sweet at you are. You've gotten some sweet gifts, friend! Loving all of the cute tees too. How fun to get Vday gifts early! I love all the vday outfit options too! Happy Friday! Aw, your Valentine's gifts are so sweet! And you look fab in your red pants! You and Kellyann have almost convinced me to try a pair! Hope you have a great weekend! Those tees really are the cutest...the coffee tee?? and the buffalo plaid are my favorite. You find the best things Andrea, truly! And how sweet are those gifts from your Valentine's. I just love it. Makes my heart smile to see you getting spoiled! SO much to LOVE in this post!!! The Valentine goodies you received this week were sooo sweet! Loved every last detail!! You have certainly been blessed with thoughtful friends and family which makes my heart so full, because you give so much love and sweetness that it's a joy to see you receive it too! Wishing you a wonderful weekend ahead and the happiest heart week to come! Love you MUCH!! xoxoxo! Love the sweet gifts from your Mom, the bike is SO cute. The red pants and leopard are DARLING. Hope you have the best weekend beautiful! I love red and leopard together, the chambray button down is a great addition! What a fabulous week you've had. The gifties are all so sweet and thoughtful, just like you! I hope you're off to a great Friday and weekend! You are full of blessings, Andrea!! And your ability to find the cutest tops is a gift. And then to be featured like that?? You totally deserve it!! I love your outfits from the week. Those graphic tees are perfect. I want to try those pens now! I have never heard of them before. I hope you have a wonderful weekend! So many fun gifts :)! Those graphic tees are super cute! 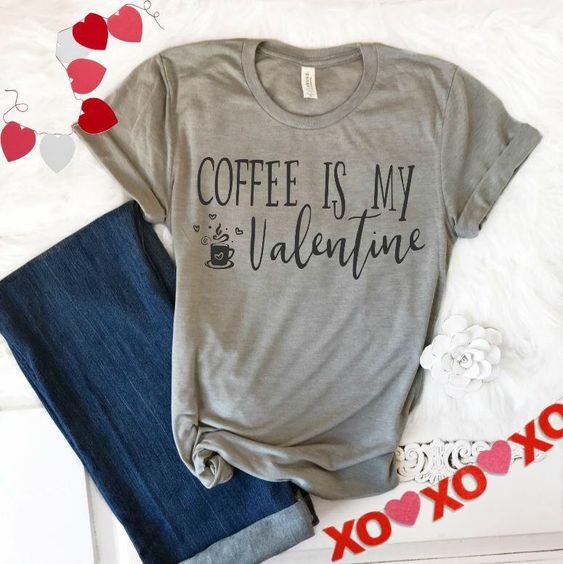 I am loving that coffee is my Valentine shirt. I need it. Loving those red pants so much. You got some amazing things for Valentine's Day! Have the best weekend! Chambray and leopard were meant for each other and the pop of red just seals it! Have a great weekend! Oh wow the little red truck art and the shirt with the same truck are so cute!! The little bike is really cute too. What lovely gifts you received! For all of the love you put out into the world, it's no wonder a lot of it comes back around to you! And, haha at finding all of the red pants denim shirt outfits--who knew it was so popular? How sweet is your friend, mom, and hubby for those awesome Valentine's goodies!!! You deserve it all. Have the best weekend, friend. That little bike is adorable!! Love your chambray top, red pants and a pop of leopard. Such a gorgeous look! Those are such fun Valentine's surprises! Your mom is sweet as can be. I love the coffee is my valentine shirt. Stay warm this weekend! 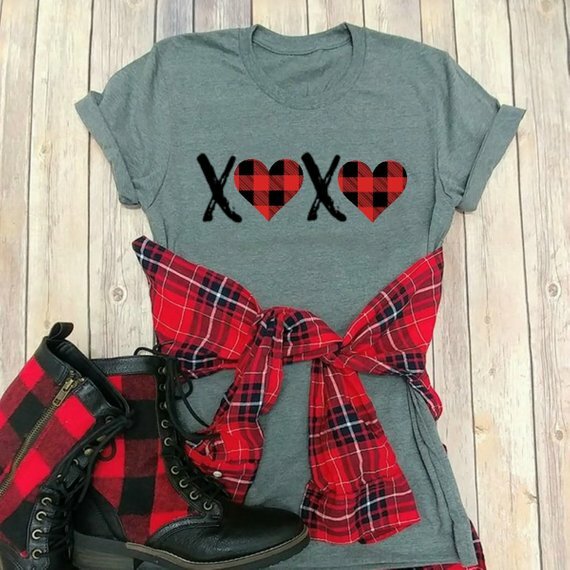 Those buffalo plaid Valentine's Day tops are the cutest!! And you KNOW I love those red pants! Have a fantastic weekend, Andrea!! red and chambray, might be my new favorite. I have both of things and will be putting this together STAT! Have a great wekeend friend! What sweet little care packages for celebrating Valentine's day! Love your Valentine's Day gifts! That little bicycle is so darling! Those red pants are fabulous on you! I love them with chambray! In love your chambray and red isn't look. You killed it! Such cute gifts! That little bicycle is so cute! Have a great weekend! Where did you purchase the shirt with red sleeves, grey torso and white heart that is pictured with Cut Out and Keep post here? I love it! So many sweet Valentine's gifts! How cute is that little bicycle! All of those graphic tee's are so fun! These are cute picks dear, loving that red pants on you too. You are just rocking away friend! So excited about your feature. 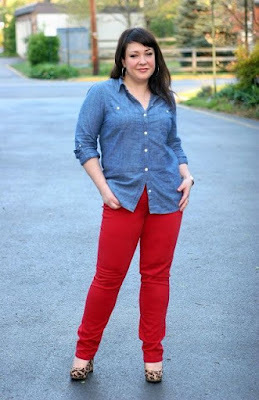 I'm in love with the chambray and red pants...I grabbed a pair recently from AT but they didn't work..I'm going to be on the hunt for another pair. That is just too cute. Oh I love all of those outfits! Wow, so many pretty outfits! I love the tees you find! I need the Dog Mom, Wine Lover tee myself! 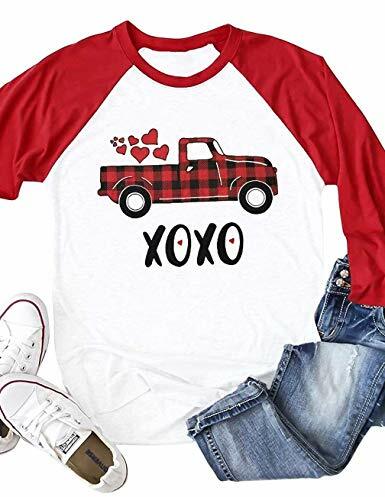 The tee with the red truck and plaid is adorable! I need a few for summer. 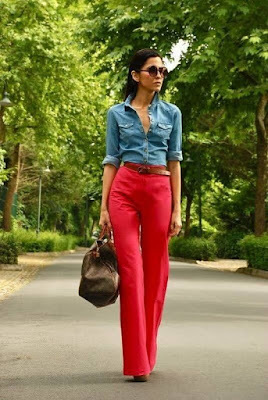 YOu look darling and rock those red pants! Love the goodies you r mom got you for Vday, so cute.